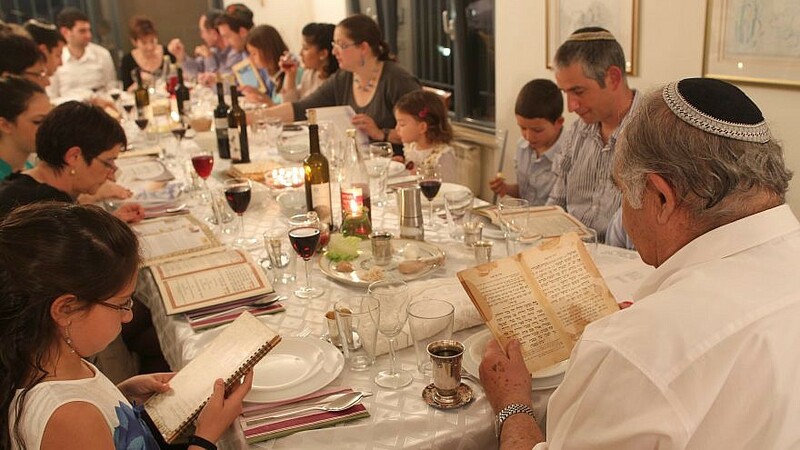 An Israeli family during the Passover seder on the first night of the holiday in Tzur Hadassah. Credit: Nati Shohat/Flash90. (April 8, 2019 / JNS) Sweet gefilte fish with a dollop of eye-watering horseradish. Fluffy matzah balls floating in golden chicken soup, raisin-dotted matzah kugel, tangy stuffed cabbage, crunchy charoset, mile-high sponge cake. These, along with the fragrance of the Passover kitchen itself—and the first taste of matzah smeared with horseradish and charoset—can transport you back to the sights, sounds and tastes of seder nights a half-century ago. Joan Nathan, the Julia Child of Jewish cooking, has updated many of her family’s Passover dishes, including Passover recipes, for her latest, King Solomon’s Table: A Culinary Exploration of Jewish Cooking from Around the World (Knopf). Paula Shoyer, author of The Healthy Jewish Kitchen (Sterling Epicure, 2017) and The New Passover Menu (Sterling Epicure), suggests an easy formula for “lightening up” traditional recipes: Take down the sugar a notch; replace some matzah meal with other kosher-for-Passover options like a mixture of almond and coconut flour; and use coconut oil (look for extra-virgin with a reliable hechshers, kosher symbols) instead of the ever-present margarine. “And people will find that if they cook from scratch, they’ll avoid all the unhealthy chemicals in the packaged Passover foods—and save money, too,” notes Shoyer. “It only takes a few more minutes to make brownies yourself.” Creating a salad dressings of olive oil and vinegar with spices can help you dodge some of the arguably less healthful oils (peanut and cottonseed among them) long associated with Passover cooking. Then there the folks whose food sensitivities—to gluten, nuts or dairy for instance—make Passover a dietary challenge. When Marcy Goldman’s nut-allergic son longed to eat her charoset, a delicious part of the seder that calls for nuts, she quickly went to work concocting a version he could safely enjoy. The result? 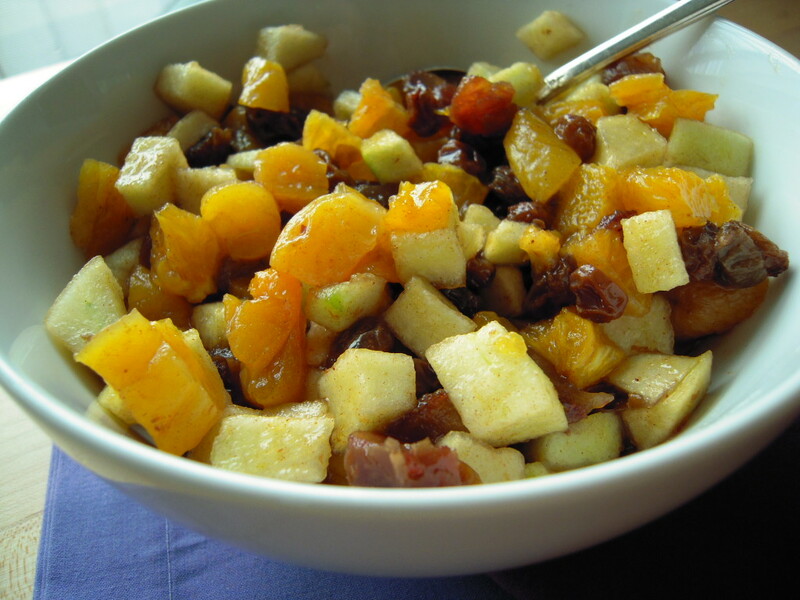 “Paradise Charoset” in her Newish Jewish Cookbook (River Heart Press). There is also oat matzah on the market that solve the gluten-free problem (you may need to order them if they’re not available near you), as they’re kosher for making a bracha (“blessing”) over (Note: Not all gluten-free matzah are, just the oat). And those sensitive to nightshades such as white potatoes will have to be vigilant about scouring the labels due to the literally tons of potato starch used in prepared kosher-for-Passover foods. Drink L’Chaim to Life. Upping the hydration gives your digestion a fighting chance of moving that slow-mo’ matzah train down the tract. Don’t Be a Coach Potato. Staying active, and taking a brisk walk daily either before meals or after the dishes are done, can also help keep you functioning physically and mentally as well as spiritually. Four Cups to the Wind. Even though the minimum for each of the four cups is about 3 ounces, all that alcohol on an empty stomach can make you feel sick, if not downright tipsy. Let your body signal you when to cut back. Or there’s always grape juice for those who cannot drink wine for medical or other reasons. Nut-free charoset. Credit: Cybele Pascal. Mix matzah meal into wet ingredients to form a workable dough; if mixture is too wet, stir in a ¼ cup more matzah meal. Cover and refrigerate for 30 minutes. Wet your hands and form matzah-ball dough into walnut-size balls. Gently place matzah balls into boiling water. 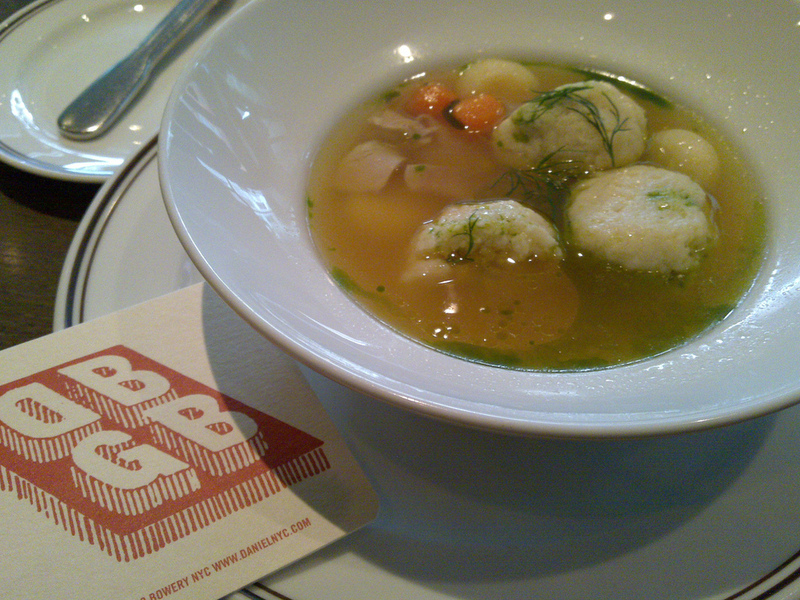 Reduce heat to low, cover and simmer matzah balls until tender, 25 to 30 minutes. Note: For firm/hard-middle matzah balls, either reduce the seltzer or add ¼ cup matzah meal. Put the fish, onions, eggs, 2 cups water, matzah meal, carrots, 4 tablespoons dill, salt, pepper, mustard and sugar in the bowl of a standing mixer equipped with a flat beater. Beat at medium speed for 10 minutes. In the bowl of a food processor, mix the horseradish and the vinegar. Process with the steel blade until finely chopped; do not purée. Add the beets and remaining olive oil. Pulse until the beets are coarsely chopped, but not puréed. Transfer to a bowl and add the salt, pepper, and lemon juice to taste. 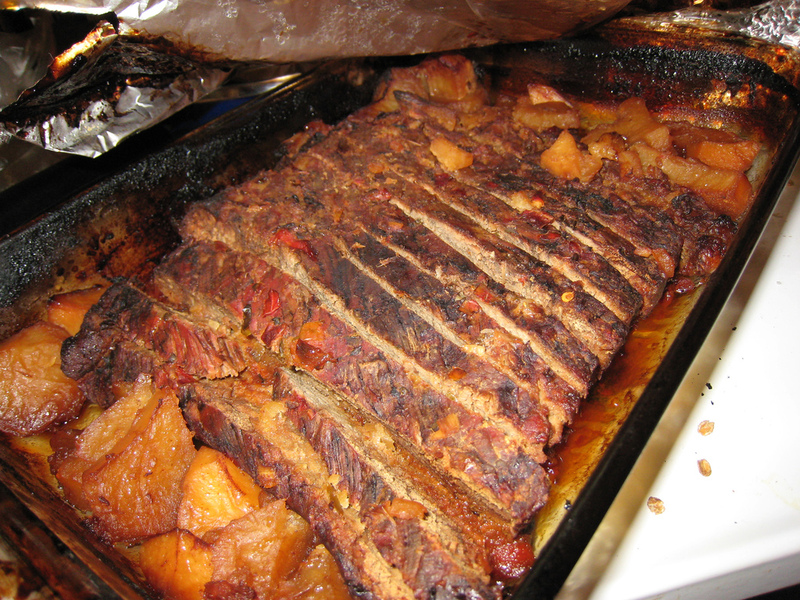 A Passover brisket dish. Credit: Flickr. For the second layer, in a bowl, blend the carrots, with squash, sugar, egg, matzah meal, salt, cinnamon and orange juice. Gently spread over broccoli layer. For the third layer, prepare cauliflower. In a small skillet, heat the oil and sauté the onion until lightly cooked and golden. Place with cauliflower in a large bowl and stir in the eggs, matzah meal, salt and pepper. Gently spread this over carrot-squash mixture.